Peeking into the Paleontology Laboratory at the La Brea Tar Pits. If you look closely to the right, you can see Hayden — the juvenile mammoth skull found during Purple Line Extension construction — in the background. 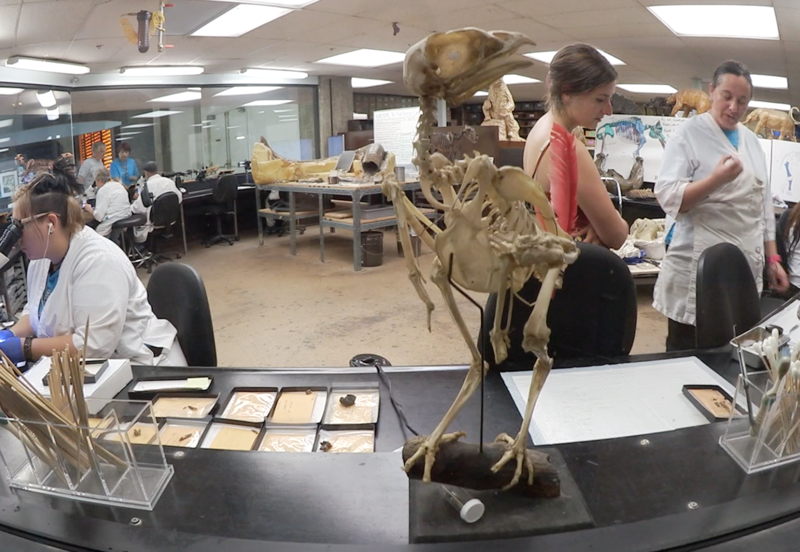 Would you like to watch paleontologists work on the Purple Line Extension fossil finds? For the next several months, you can visit the Paleontology Laboratory at the La Brea Tar Pits & Museum and watch paleontologists work on Hayden, the juvenile mammoth fossil found during the excavation of Wilshire/La Brea Station, as well as plenty of other specimens. Dr. Ashley Leger, PhD., was kind enough to give us a brief tour of the Paleontology Lab and the Tar Pits. Dr. Leger is the Paleontological Field Director for Cogstone Resource Management and works closely with Metro’s Purple Line Extension team to identify and preserve any fossils found during construction. Dr. Leger demonstrating how paleontologists carefully clean up the fossil before permanent preservation. A look at what Hayden could have been had s/he not died so young…10,000 years ago. Once Hayden’s skull is cleaned up and permanently preserved, she/he will be turned over to the Natural History Museum at Expo Park. Whether the skull will be put on display will be up to the NHM, but chances are high because Hayden’s a very good local specimen. Here’s hoping we haven’t seen the last of him/her! To visit the La Brea Tar Pits, take Metro Bus 20 or DASH Fairfax to Wilshire/Curson. You can also take the Metro Rapid 720 to Wilshire/Cochran and walk west on Wilshire Boulevard for about 10 minutes, or take Metro Rapid 780 to Fairfax/Wilshire and walk east on Wilshire for about 10 minutes.